Precast Concrete Pavers - Tile Tech Inc.
Precast concrete pavers have been in the limelight for quite a while. These pavers are the popular choice among architects and landscape designers because of their flexibility and variety. Whether you’re aiming for an earthy atmosphere or a summer setting, these pavers can be custom built to recreate your ideal environment. Lots of spaces have come alive with these materials. It’s high time to transform your own living space. Sand, gravel, pebbles and cement are the basic raw materials for making precast concrete pavers. 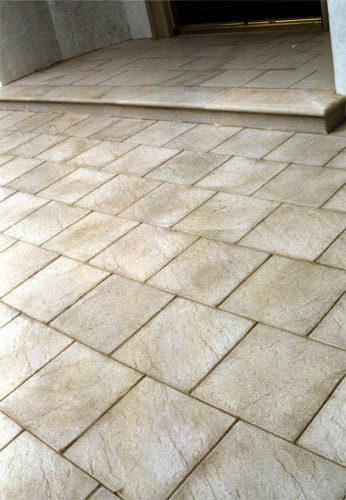 With the application of colours and the use of moulds, the beauty of natural stone pavers can be replicated. Precast pavers are high density materials similar to natural stones. It can withstand compression and are also water resistant. These qualities make precast concrete pavers cost-effective alternatives to natural stone pavers that are typically expensive and difficult to acquire. Raw materials can be mixed and matched to achieve the right colours to complement your tastes. Precast concrete pavers can emulate a wide range of colours starting from the lighter tones of limestone to the darker hues of natural sandstone. Manufacturers achieve this through the application of two types of colouring materials: a) powdered dyes; and b) liquid stains. These materials are typically added to the concrete mixture while it is still wet. Once added, the naturally grey colour of cement is changed to the colour of the dye or stain. Some of the most commonly applied colours are earth tones such as beige and rusty orange; green shades like forest green and pastel green; and peach tones. Two to three different coloured pavers can be combined to achieve interesting patterns. Smooth, washed, course textures can all be achieved with the aid of advanced moulding technologies. With these modern techniques, manufacturers can form stepping stones into cobblestones or bricks. There also portable concrete moulds available for people who love to do home improvement projects. All that is required is to pour concrete on the mould and allow it to set. Voila! You’ve just made your own precast cobblestone paver. Using precast concrete pavers have lots of advantages. First, concrete is a durable material and is said to last for over 100 years! That’s a really long time. Second, compared to other materials, the strength of concrete develops over time making it suitable to bear heavy loads and structures. Third, precast concrete requires minimum maintenance. Precast concrete pavers are versatile, flexible and easy to install. They are the perfect materials to add a dash of life to any dull living space. Homeowners want to enjoy their homes, but they also see upgrading their back yards as an investment. Using Precast Concrete Pavers for patios, sidewalks, and driveways is becoming more and more popular in the United States and Canada, because of their affordability, strength, and durability. Patio Pavers offer a wide variety of paving options. With the many sizes, shapes, colors, designs and patterns available, combined with slip resistance and attractive finishes, patio pavers are one of the most versatile paving products available. Individual pavers can also be replaced at anytime, making repairs easy and affordable. Many common applications include: patios, entrance areas, sidewalks, walkways, terraces, garden paths, pool decks and courtyards. Patio pavers create entertaining areas ranging from informal, intimate spaces to large, formal terraces. Steps provide comfortable transitions from one level to another.